"Confederacy chief is refusing to pay UIC premiums to Ottawa"
A traditional Mohawk chief who owns a video store at Six Nations says he will not remit unemployment insurance premiums to the federal government. Allen MacNaughton, an Iroquois Confederacy chief who owns Mohawk Video on Sour Springs Road, told Six Nations band councillors Tuesday night that he was angered by a recent visit from an employee of Revenue Canada. The federal worker told Mr. MacNaughton he was required to deduct unemployment insurance from his employees' pay and demanded to see the store's records. "I am a traditional Mohawk chief. Never before have I had anyone come down like that," said Mr. MacNaughton, who has owned the store since 1989. Confederacy chiefs and their followers have always maintained that they are not Canadian citizens but allies of the Crown, and therefore they should not be required to follow the federal government's laws. He said treaties such as the Two Row Wampum, in which the Europeans and the native people agreed not to interfere in each other's business, support his position. "These guys don't go down to New York State doing this there, and they shouldn't be doing it here, either," said Mr. MacNaughton. 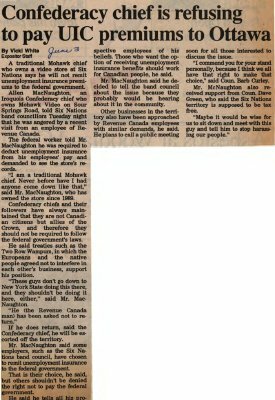 "He (the Revenue Canada man) has been asked not to return." If he does return, said the Confederacy chief, he will be escorted off the territory. Mr. MacNaughton said some employers such as the Six Nations band council, have chosen to remit unemployment insurance to the federal government. That is their choice, he said, but others shouldn't be denied the right not to pay the federal government. He said he tells all his prospective employees of his beliefs. Those who want the option of receiving unemployment insurance benefits should work for Canadian people, he said. Mr. MacNaughton said he decided to tell the band council about the issue because they probably would be hearing about it in the community. Other businesses in the territory also have been approached by Revenue Canada employees with similar demands, he said. He plans to call a public meeting soon for all those interested to discuss the issue. "I commend you for your stand personally, because I think we all have that right to make that choice," said Coun. Barb Curley. Mr. McNaughton also received support from Coun. Dave Green, who said the Six Nations territory is supposed to be tax free. "Maybe it would be wise for us to sit down and meet with this guy and tell him to stop harassing our people." MacNaughton, Chief Allen ; Curley, Barb ; Green, Dave. Government of Canada ; Haudenosaunee Confederacy Chiefs Council.